Topiramate is a sulfamate substituted monosaccharide. Topiramate has the molecular formula C12H21NO8S and a molecular weight of 339.37. Topiramate is a white crystalline powder with a bitter taste. The precise mechanisms by which Topiramate exerts its anticonvulsant and migraine prophylaxis effects are unknown. Electrophysiological and biochemical evidence suggests that Topiramate, at pharmacologically relevant concentrations, blocks voltage-dependent sodium channels, augments the activity of the neurotransmitter Gamma Amino Butyrate at some subtypes of the GABA-A receptor, antagonizes the AMPA / kainate subtype of the glutamate receptor, and inhibits the carbonic anhydrase enzyme, particularly isoenzymes II and IV. Topiramate tablets are indicated as initial monotherapy in patients 10 years of age and older with partial onset or primary generalized tonic-clonic seizures. Topiramate tablets are indicated as adjunctive therapy for adults and pediatric patients (ages 2-16 years) with partial onset seizures, or primary generalized tonic-clonic seizures and in patients 2 years of age and older with seizures associated with Lennox-Gastaut syndrome. Topiramate tablets are indicated for adults for the prophylaxis of migraine headache. The usefulness of Topiramate in the acute treatment of migraine headache has not been studied. In order to avoid early side-effects (e.g. cognitive dysfunction) the initial dose normally is low and increased in slow steps. The usual initial dose is 25 to 50mg daily in 2 single doses. Recommended increments are 25 to 50mg every 1 or 2 weeks. Common doses for maintenance treatment are 100 to 200mg daily. The highest dose possible is 1,000mg daily in divided doses. The recommended maximum dose for Topiramate monotherapy in adults and children 10 years of age and older is 400 mg/day in two divided doses. Adults (17 Years of Age and Over): Partial Seizures, Primary Generalized Tonic-Clonic Seizures, or Lennox-Gastaut Syndrome - The recommended total daily dose of Topiramate as adjunctive therapy in adults with partial seizures is 200-400 mg/day in two divided doses, and 400 mg/day in two divided doses as adjunctive treatment in adults with primary generalized tonic-clonic seizures. It is recommended that therapy be initiated at 25-50 mg/day followed by titration to an effective dose in increments of 25-50 mg/week. Titrating in increments of 25 mg/week may delay the time to reach an effective dose. Pediatric Patients (Age 2 - 16 Years): Partial Seizures, Primary Generalized Tonic-Clonic Seizures, or Lennox-Gastaut Syndrome - The recommended total daily dose of Topiramate as adjunctive therapy for patients with partial seizures, primary generalized tonic-clonic seizures, or seizures associated with Lennox-Gastaut Syndrome is approximately 5 to 9 mg/kg/day in two divided doses. Titration should begin at 25 mg (or less, based on a range of 1 to 3 mg/kg/day) nightly for the first week. The dosage should then be increased at 1 or 2 weeks intervals by increments of 1 to 3 mg/kg/day (administered in two divided doses), to achieve optimal clinical response. The recommended total daily dose of Topiramate as treatment for prophylaxis of migraine headache is 100 mg/day administered in two divided doses. Pediatric Use: The safety of Topiramate has not been established in case of children under two. Patients may experience hypoglycemia while taking this medication. 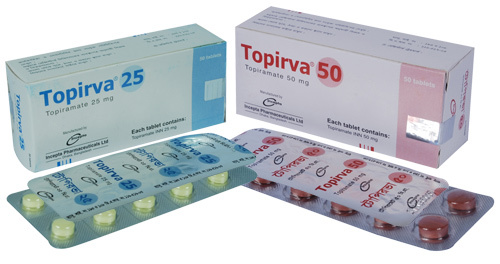 Topiramate may cause other side effects such as slow thinking or movements, difficulty concentrating, speech problems, specially difficulty thinking of specific words, memory problems, lack of coordination, trouble walking, confusion, nervousness, aggressive behavior depression, headache, extreme tiredness. The major route of elimination of unchanged Topiramate and its metabolites is via the kidney. Dosage adjustment may be required in patients with reduced renal function. In hepatically impaired patients, Topiramate should be administered with caution as the clearance of Topiramate may be decreased. Pregnancy: Topiramate is pregnancy Category C. Topiramate should not be given to a pregnant woman. Nursing Mothers : It is not known whether this drug is excreted in human milk and so caution should be exercised when Topiramate is administered to a nursing woman.